Ecumenical guests are welcomed to the 2012 United Methodist General Conference in Tampa, Fla., by Bishop Sharon Zimmerman Rader (on video screen). Rader is ecumenical officer for the denomination's Council of Bishops. Delegates from 24 communions with a relationship to The United Methodist Church were honored. A UMNS photo by Mike DuBose. Click on image to enlarge.View more photos. The United Methodist General Conference on April 26 welcomed ecumenical delegates from 24 affiliated Methodist or united churches around the world. Bishop Sharon Zimmerman Rader, the ecumenical officer of the United Methodist Council of Bishops, said that mutual recognition among Methodist denominations provides creative interaction and sharing of new forms of Christian service. A majority of the 24 churches - at least 13 in the Latin American-Caribbean area and nine in Asia - were mission-founded by United States-based denominations that now comprise The United Methodist Church. They became autonomous or united with other Christians in the process of maturing. One exception to this pattern is the Methodist Church in Britain, the original Methodist body that emerged from the ministry of the Rev. John Wesley across the latter half of the 18th century. The Methodist movement came to the Americas in the 1770s. The British "mother church" stands in special relation to all Methodists. The Methodist Church of the Caribbean and the Americas also has strong British roots. Both British and American churches placed strong emphasis on sending missionaries throughout the 19th century and the 20th century and continue the tradition today. 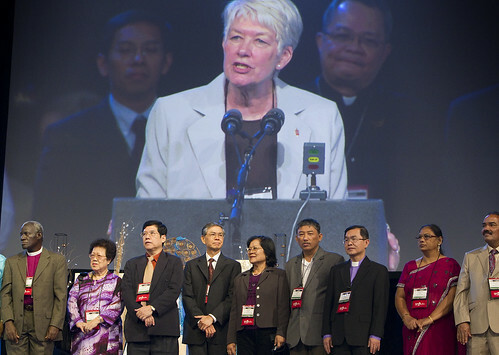 The United Methodist General Conference meets every four years to conduct the business of the 13-million-member denomination that has organic units in the United States, continental Europe and Eurasia, the Philippines and many parts of Africa. It has a possible 1,000 voting delegates, of which 10 can be from four affiliated groups with which United Methodists have special arrangements called concordats. Four voting delegates are from Britain, and two each from the Methodist Church in the Caribbean and the Americas, the Methodist Church of Mexico and the Methodist Church of Puerto Rico. "Covenants" exist with the 20 other denominations. These covenants and concordats, Rader said, establish "mutual acceptance and respect" and also mean that clergy are generally transferable among affiliated churches. Among the oldest of the Methodist churches affiliated with the United Methodists are the Korean Methodist Church and the Methodist Church of Brazil, both of which became fully autonomous in 1930. The United Church of Christ in the Philippines is an affiliated church through its historic ties with the Evangelical United Brethren Church, which united with The Methodist Church in 1968 to form the United Methodist denomination. A large network of United Methodist congregations and conferences also exists in the Philippines. The Evangelical Church of the Dominican Republic was founded in 1922 as a joint effort of the former Methodist Episcopal Church, South, the Evangelical United Brethren and a Presbyterian church. Each ecumenical delegate was greeted by Bishop Rosemarie Wenner of Germany, new president of the Council of Bishops, and Bishop Larry Goodpaster of the Charlotte (N.C.) Area, past president of the council. The group received prolonged applause and a standing ovation from the conference. Bishop Saw Shwe of Lower Myanmar responded to the welcome on behalf of the ecumenical delegates. He said he first attended General Conference in 1984 when the affiliated group was seated in the back of the hall. "This year," he said, "we are right at the front, seated not as guests but as part of the family." Here is a full list of the related churches and their delegates.